16 SAMPLE SLOTS – The PO-33 K.O. is a micro-sampler from Teenage Engineering equipped with eight melodic sample slots and eight drum slots, giving you a wide range of sounds to play. 16 BUILT-IN EFFECTS – Enjoy looping a variety of effect sounds with the PO-33 K.O. You can choose or combine unison, stutter, scratch, 6/8 quantize, and more. CREATE A SONG! – Create complex sequences with PO-33’s 16 patterns, 16-step sequencer, and parameter locks. CA-X SILICONE CASE – This professional Silicone case from Teenage Engineering is the perfect protection for your Pocket Operators, including the PO-33 KO. It features great-feeling button that covers and protects the Pocket Operator’s LEDs. Thanks to the anti-slip feet, you can prevent the PO-33 from sliding away. INCLUDES – Teenage Engineering Pocket Operator PO-33 KO Micro Sampler. CA-X Generic Silicone Case. Blucoil Audio Premium Earphone and Headphone 3.5mm Extension Cable (6-Feet/1.82 Meters) for Phones, Computers, MP3 players, Portable Amps, Stereo Equipment and more. 2-Pack of Blucoil AAA Batteries. Enjoy creating groove sounds with the new Pocket Operator, PO-33 K.O. Teenage Engineering expanded their PO series and manufactured this micro sampler loaded with great features. This compact unit has 40 seconds of sample time, 8 slots for melodic samples and 8 slots for drum samples. You can create complex sequences with the 16-step sequencer and 16 patterns. It also has a built-in microphone for your audio records. The Blucoil extension cable is equipped with gold-plated universal 3.5mm male and female tips. Compatible with all smartphones, computers, MP3 players, portable amps, and more. It instantly provides extra 6 feet (1.82 meters) length to your stereo equipment or other devices. 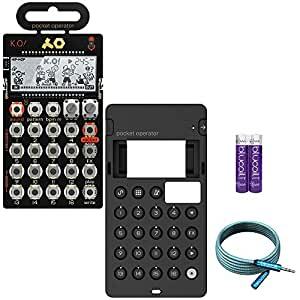 Additional Teenage Engineer CA-X Generic Silicone Case for PO-33 KO and 2 Pack of Blucoil AAA Batteries to complete your bundle!